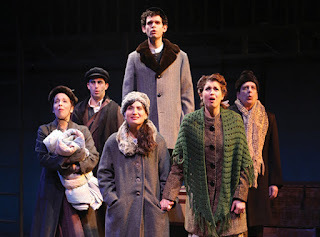 The National Yiddish Theatre - Folksbiene production of The Golden Land has re-opened at the Baruch Performing Arts Center and is now scheduled to run through January 6, 2013. So if you missed the original run (whose opening was delayed by Hurricane Sandy and which concluded on December 2), you've just been given a second chance to see it. The two hours long epic musical traces the Jewish immigrant experience from the 1880s to the mid-twentieth century and is performed in a combination of English and Yiddish, but even if you don't speak Yiddish, nisht geferlach (don't worry about it) - you'll still fully understand what's going on. The musical attempts (mostly successfully) to cover an enormous amount of ground - chronicling Jewish history from Ellis Island to the Lower East Side to Harlem and the Ivy League, and touching along the way - in song and dance - on the beginnings of the labor union movement, the Triangle Fire, Jewish Borscht Belt humor, Yiddish Theatre, the Depression, both World Wars, the Holocaust, Rumania, the founding of the State of Israel, and much, much more. Created by Zalmen Mlotek and Moise Rosenfeld and directed by Bryna Wasserman, the musical is a very ambitious production. The young and talented six person cast is called upon to play dozens of different roles and does so with great exuberance, belting out 49 songs in English and Yiddish along the way. They are all wonderful but my absolute favorite was the dynamic Daniella Rabbani whose rendition of "Oy, I Like Him" and "A Khulem" ("A Dream") brought down the house. The cast is solidly supported by Zalmen Mlotek's great seven piece klezmer band. Clara Ann Fowler (Haley Jane Pierce) was born into a large, poor family in 1927 in Claremore, Oklahoma, one of eleven children. Her father, Ben Fowler (Willy Welch) worked for the railroad, while her mother and older sisters picked cotton. Despite the poverty of her early years (the family home lacked electricity), she somehow evolved into the “Singing Rage” Miss Patti Page (Lindsie VanWinkle), one of the most legendary female singers in popular recording history, with111 hits on the Billboard charts and 100 million records sold to her credit. But through it all and beneath Patti Page’s vibrant, sophisticated public persona, Clara Ann Fowler’s core simplicity and vulnerability remained. In 2011, the University of Central Oklahoma’s College of Fine Arts & Design’s Broadway Tonight presented the world premiere of Flipside: The Patti Page Story, written and directed by the multi-talented Greg White (artist, actor, director, playwright, producer, and professor) based on his interviews with Miss Page. A year later, the musical was selected from among nearly 3,500 productions to attend the 2012 Regional & National Kennedy Center Festivals where it won several honors including Best Musical. And now it has arrived at 59E59 Theaters where it is enjoying a limited run (only through year-end) in its New York premiere. Flipside’s producers are planning a National Tour in 2013-14 and that’s a good thing – at least for the rest of the country.. But it’s too bad that New Yorkers won’t be given a longer opportunity to see this show as well, since to do so is truly is a delightful musical experience. 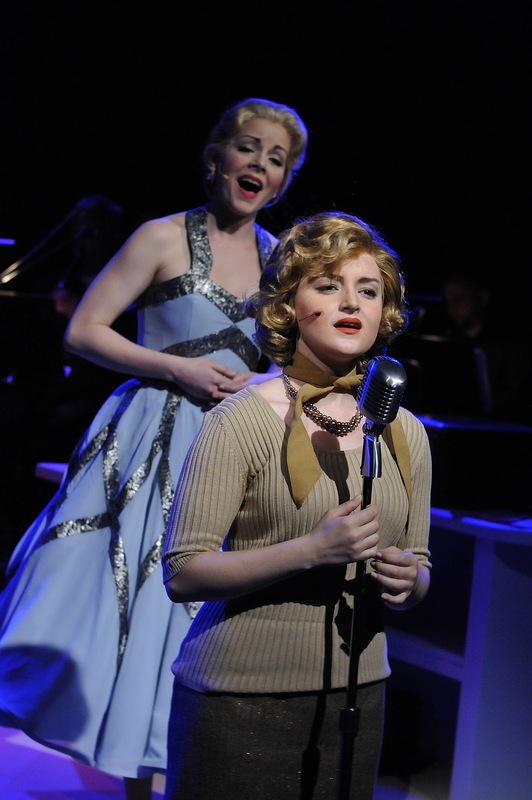 Haley Jane Pierce plays Clara Ann Fowler with great sensitivity and Lindsie VanWinkle is equally accomplished as her much more confident alter ego, Patti Page. 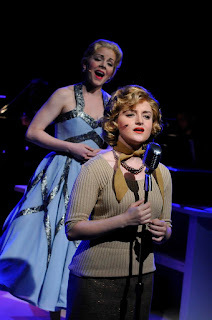 Willy Welch is fine as Clara’s dad, and Jenny Rottmayer and Kassie Carroll are charmingly professional in the variety of roles they are called upon to perform as Clara’s sisters and mother and any number of backup singers, radio personae, announcers, and reporters. The all do a good job of moving the story along. It didn’t take very long before Ed Carpolotti’s untimely death threw his widow’s life into turmoil. Virginia Carpolotti (Penny Fuller) discovered that under the terms of his will, she was now president of Ed Carpolotti, Inc., her late husband’s construction company, about which she knew next to nothing. But she quickly learned that business at the company had been rather slow (not good news) although the company did appear to have substantial assets (much better news). But, unfortunately (and this was much worse news) those assets had been pledged against hundreds of thousands of dollars in bank loans (according to Bob O’Klock from the bank) and the loans were six months in arrears. And then it got even worse. Turns out that Virginia unwittingly signed papers assuming personal responsibility for those loans, as a result of which the bank has now frozen her bank accounts and threatened to seize all her personal assets – her checking account, savings account, CDs, IRAs…. And then it got worse yet: Dino Disperbio, the owner of Smith Trucking (a company with no trucks and no one named Smith in its history) has just contacted her to say that Ed had borrowed another half million dollars (at a 50% interest rate, no less!) from him and, because of other papers Virginia signed, she’s on the hook for that too. And so, naturally, Virginia turns to family – Ed’s brother, Frank – only to learn that Ed owed Frank another $300,000 but that soft-hearted Frank, being family and all, is willing to settle with Virginia by just taking her house. Could she be out by March? It doesn’t seem that Virginia’s plight could get any worse, right? Well, it does. She receives an anonymous note from a blackmailer threatening to reveal thirteen embarrassing and scandalous things about her late husband and others unless she gives him a million dollars within a week. At her wit’s end, Virginia pours out her heart to her friend, Tootie Vaughn (despite having been warned to say nothing to anyone). We learn all of this and more from Virginia herself in what turns out to be something of an hour long monologue interspersed with music, without ever really meeting Ed or Bob or Dino or Frank or Tootie or Danny (Ed and Virginia’s attorney) or Debbie (their daughter) or Debbie’s husband or children or Joy (Ed’s secretary) or Virginia’s parents - all of whom are talked about, but none of whom actually shows up. In fact, the only character other than Virginia herself to actually appear in this musical, 13 Things About Ed Carpolotti, now premiering at 59E59 Theaters, is the very accomplished pianist (Paul Greenwood) who plays a double role as her musical accompanist and her unconscious mind. Virginia’s problems and all the chicanery and mysterious goings-on ultimately are resolved but I won’t tell you how for that would ruin all the fun. Suffice it to say that the original play by Jeffrey Hatcher, on which this musical is based, is very cleverly constructed and charmingly written and that, to the extent that the musical sticks to the original play, it is fun to see. Penny Fuller does a first rate job in a demanding role and Paul Greenwood brings a light hearted charm to his part. But, unfortunately, converting the play into a musical didn’t bring anything special to the mix. The score is pleasant but derivative and the lyrics sophomoric at worst and unmemorable at best. The show is definitely worth seeing and if you go, I think you’ll enjoy it, but that will be despite the music, not because of it. Golden Boy, one of Clifford Odets’ least politically charged and most commercially successful plays, originally opened at the Belasco Theatre on Broadway in 1937 where it ran for more than 250 performances. The play had a short-lived revival in 1952, served as the basis of a musical starring Sammy Davis Jr., and was twice adapted for the movies, but otherwise was seldom revived. Now it is receiving a well-deserved long overdue revival by Lincoln Center at the Belasco Theatre where it first premiered three-quarters of a century ago. As it turns out, this revival is terrific and it was well worth having waited for. The plot revolves around young Joe Bonaparte (Seth Numrich), who is torn between pursuing a career as a musician (he is a highly talented violinist) and a potentially much more lucrative career as a prizefighter (which could result in injury to his hands thereby limiting or even destroying his ability to play the violin). Complicating matters, Joe and Lorna Moon (Yvonne Strahovski) fall in love. Lorna, a self-described “tramp from Newark” is the mistress of Tom Moody (Danny Mastrogiorgio), Joe’s manager. Tom is married and Lorna has been waiting patiently for him to divorce his wife so that she might marry him; the entrance of Joe on the scene complicates her emotional life enormously. Numrich, Strahovski, and Mastrogiorgio are wonderful in their respective roles but it is Tony Shaloub in the role of Mr. Bonaparte, Joe’s father, who really steals the show. Shaloub’s acting range is extraordinary: best known for his memorable television roles (as Adrian Monk in “Monk,” as Antonio Scarpacci in “Wings,” and as a cabdriver in “Taxi”), Shaloub, an Arab-American, proves equally adept in his depiction of Joe’s tortured, loving Italian father on stage in this, his Lincoln Center debut. 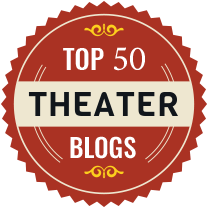 The play is rife with sub-plots and secondary attractions, mostly of a two-dimensional nature: as Odets has written them, none are particularly creative but taken for what they are, they are mildly entertaining. Anthony Crivello plays the part of the gangster Eddie Fuseli seeking to wrest control of Joe from Tom Moody in classic grade B tough guy gangster movie fashion. Lucas Caleb Rooney plays the part of Frank Bonaparte, Joe’s union organizing brother, in similar caricaturish fashion. And Jonathan Hadary brings a measure of comic relief to the play as Mr. Carp, Mr. Bonaparte’s neighbor and friend. This is not a deep play and it breaks no new ground. But given the limitations of the play itself, it is highly entertaining and this production (including set design, acting and direction) is as good as it gets. 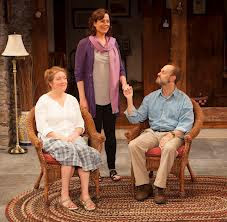 Vanya (David Hyde Pierce), Sonia (Kristine Nielsen), and Masha (Sigourney Weaver) were named after characters in Chekhov’s plays by their now deceased parents who had been college professors and lovers of community theatre in their prime. Vanya and Sonia devoted their lives to their parents care, remaining in their ancestral home and foregoing any other meaningful personal relationships, while Masha established herself as a successful actress (although she was somewhat less successful on the marital front with five failed marriages to her credit). Sonia and Vanya are resentful toward Masha who, as they see it, left the entire burden of caring for their parents to them, while she was gallivanting about on the world’s stages and enjoying a glamorous life. True enough, perhaps, but to be fair to Masha, it was she who provided all the money to maintain her parents’ and siblings’ home and to support them all while she was away; absent her financial support, who knows what might have come of them all. Now Masha has returned to visit her brother and sister, with her latest boy toy, Spike (Billy Magnussen) in tow to let them know that she intends to sell the house. The play that Christopher Durang has constructed around these premises, Vanya and Sonia and Masha and Spike, now playing at Lincoln Center’s Mitzi E. Newhouse Theater, is replete with heavy-handed allusions to Chekhov’s work. Vanya’s and Sonia’s ethereal next door neighbor Nina (Genevieve Angelson) might have just wandered in from Chekhov’s The Seagull and then takes to calling Vanya “Uncle Vanya.” The siblings quibble over whether or not the ten or so cherry trees on their property constitute a true “cherry orchard.” (And there is at least one allusion to Ibsen as well: Sonia may not see herself as a “wild duck” but she does persist in referring to herself as “a wild turkey.”) And yet, according to the playwright, Vanya and Sonia and Masha and Spike is not a parody of Chekhov at all; rather, as Durang puts it “The play takes Chekhov characters and themes and puts them into a blender.” And, Durang might have added (though he didn’t), he threw a big dollop of comedic good humor into the blender as well. The net result is a play that gets off to a slow start but then turns out to be rollicking good fun. The first half of the first act is a bit flat with the characters coming across more as two dimensional caricatures than fully fleshed out individuals. But by the second half of the first act, and especially in the second act, Durang hits his stride and at least some of the actors are given the opportunity to turn in truly superlative performances. Which two of them – Nielsen and Hyde Pierce – do with a vengeance. Nielsen and Hyde Pierce really do steal the show although Magnussen and Angelson turn in perfectly adequate performances as Spike and Nina, respectively. I was a bit disappointed in Weaver’s portrayal of Masha which struck me as rather pedestrian. But Shalita Grant, the sixth actor in the play, did a fine job as Cassandra, Vanya’s and Sonia’s cleaning lady who is also a soothsayer and voodoo practitioner. In sum, this is a good (albeit not great) play, providing a couple of hours of cheerful entertainment. And while a familiarity with Chekhov isn’t absolutely required to enjoy the play, such a familiarity would, I think, enhance your experience.